The Scottish government should "come clean" about alternatives to post-independence currency union with the rest of the UK, Ed Miliband has said. The UK Labour leader told the BBC there were "big risks" with any currency option if Scots vote "Yes" to independence. Finance Secretary John Swinney said setting up a separate Scottish currency was "perfectly viable". But he insisted the UK government would agree to a currency union. Both men were speaking to the BBC's Good Morning Scotland programme. Mr Miliband, who was in Glasgow to address the Scottish Chambers of Commerce, said: "If you're going to have currency union, you're also going to need a political union, you need a union of decisions on tax and spending, on banking." He added: "What the SNP needs to come clean about is that there are big risks, big instability, whatever currency option they choose in an independent Scotland. "I believe that risk is going to be borne, not by the richest who can move their money around, but by working people. "And it is a really important reason why alarm bells should be ringing and people trying to decide how they vote in this referendum should have real reasons for caution about what this would mean." The Scottish government has argued that a currency union would be in the interests of Scotland and the rest of the UK if Scots opt for independence in a referendum in September. However, the UK government has said it will not agree to such a deal, and the Labour leader has also argued that Scotland can only keep the pound if it stays in the UK. The Scottish government has also suggested that a currency deal could be done in return for Scotland accepting a share of UK government debt. Mr Miliband claimed any suggestion that Scottish ministers were contemplating "defaulting" on debt "should set the alarm bells ringing even louder". Mr Swinney told the same programme that monetary union had been the recommendation of a fiscal commission set up to advise the Scottish government. "The option of an independent currency is perfectly viable but the fiscal commission recommended to us that it was not as strong and not as beneficial to the Scottish interest as sterling would be," he said. Such a deal would "enable Scotland to trade more freely with the rest of the UK" and allow an integrated financial services market to continue, he added. Image caption John Swinney said UK rejection of a currency union was "a ridiculous proposition"
Mr Swinney described the refusal of a currency union as "a ridiculous proposition" as any UK government would not want to increase costs for business or harm cross-border trade. He argued: "They cannot turn round to the electorate in the rest of the UK and say we are going to let the Scots go away debt-free from the United Kingdom, we are going to let them off from an annual cost of £5bn. "That's why they will agree to a currency union after independence." Scottish ministers also used the occasion of Mr Miliband's visit to challenge Labour to "come clean" on the NHS budget, claiming that "privatisation" in England would result in cuts in Scotland. The Scottish government claimed that every £10 cut from budgets in England means a £1 cut in Scotland under the Barnett formula for distributing public spending around the UK. Scottish Health Secretary Alex Neil said: "Mr Miliband knows perfectly well how Scotland is funded under devolution - now he must come clean on the huge impact that NHS privatisation in England will have on this budget. "It was of course Labour who opened the floodgates on privatisation when they were last in office. "Now Ed Miliband and his colleagues are going round telling everyone that privatisation will eventually destroy everything that is precious about the NHS. "Does he seriously expect the people of Scotland to believe that the objective of this privatisation is to increase public spending?" Scottish Labour's health spokesman, Neil Findlay, said: "The bottom line is that as the Scottish government, the SNP has the power to decide how to pass on cuts to funding." 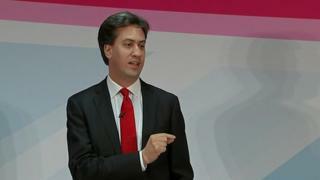 He added: "The only way to rid England of the privatisation of the NHS is to vote for a Labour government in 2015. "Here in Scotland every party has pledged to protect the public ownership of our health service so it's a sign of how desperate the SNP have become to use it as a political pawn for independence."